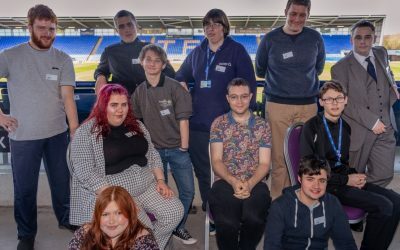 Kathleen started her supported internship at Shrewsbury College in October 2018, where she then began her placement with the Holiday Inn Shrewsbury in the September 2018. Kathleen has fitted into the structure of the hotel and is thriving in the variety of roles that she has been assigned in which no two days are the same. Kathleen has gained many valuable skills from working on the front reception desk where she is happy to book in or check out the guests as they arrive and depart. She is also learning a lot from serving drinks at the bar and is learning about all aspects of hotel life. Kathleen answers phone calls and is consistently seen as a happy and enthusiastic member of the team. The staff at the hotel have always made time to accommodate Kathleen into the team breakfast and as a result Kathleen really feels like a valued member of the workforce. 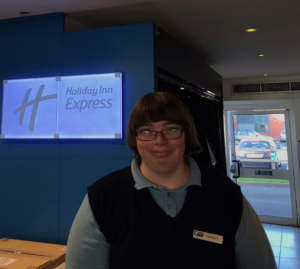 Kathleen’s confidence continues to grow and she is happy and proud to wear the uniform of the Holiday Inn. She would love the opportunity of an Apprenticeship in hospitality in the future.